Screeee! Fzzzzzzz! Cracccck! Thus spake the average rocker’s effects set-up-until a wizard-like genius put his foot down and equipped Lou Reed, Paul McCartney, The Bay City Rollers and scores of others with the custom-built “boards” scores of others with the custom-built “boards and ”racks”. Danny Eccleston gets wired-up with the Sussex sonic sultan – and wife! It’s how you imagine the BBC Radiophonic Workshop must have looked circa 1969. Half second-hand electrical goods emporium, half boffin’s lair, Pete Cornish’s Sussex headquarters is a grotto of technological arcane. Home-made cables hang hooks, boxes of capacitors and punnets of valves (12AX7As, 6L6GCs, heart-of-a- Marshall EL34s) line the shelve, and a pair of green-screened oscilloscopes blip sporadically. 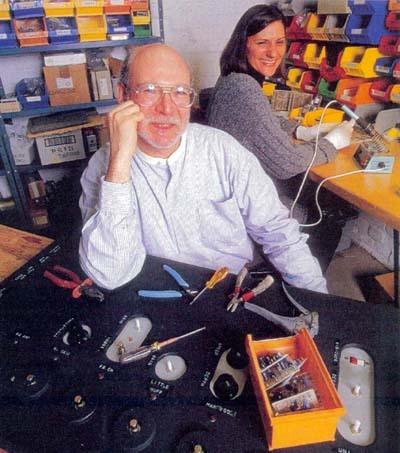 In a corner, in white, lint-free gloves, Lynda “queen of the acid dip” Cornish pores over an array of mazy circuit boards. Pete Cornish is the Professor Quartermass of live rock’n’roll. When the biggest (and necessarily, the most loaded) names in rock need their effects pedals rationalizing, their voltages stabilizing or the last hair of extraneous noise expunged from their otherwise pant-wettingly bell-like guitar sound, they come to him. And have done for two decades. Gilmour (“Oooh, a lovely guitar sound”) proved the perfect ad, and work followed with Genesis, King Crimson, Roxy Music, The Police, The Pretenders, Mark Knopfler, Sting, Macca, Jimmy Page and, er, The Bay City Rollers. These days, to own anything Cornish-designed is a sign that you’ve arrived. These days, the Cornishes’ work is mainly split between their pedal boards and rack systems. For the former, they will receive a boxful of the artist’s favourite effects pedals, gut them, modify the wiring for improved reliability and guitar signal integrity and conceal them in a single, sturdy and frankly enormous wooden box, with size 11-friendly buttons replacing the original units’ flimsy switches. Bingo! The stage is no longer untidily strewn with cables and unless the determined memorabilia hunter is built like Charles Atlas, your FX set-up is completely safe, sound and pretty much impervious to damage. 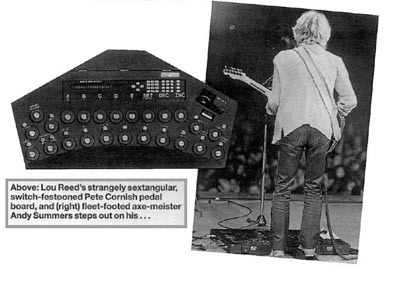 The LED-infested racks, on the other hand, are the really big boy’s toys, and for these Pete will recommend certain preamps and power amps (invariably the US Soldano brand), while stacked above and below you’ll find every combination of sound colouring and effect, controllable from a front-of-stage pedal board. These range from the simple to the sci-fi, Lou Reed’s being one of the most impressive and Greg Lake’s – four buttons governing over 100 units and 17 amps-representing one of the most deceptively basic. Current projects for the husband-and-wife team include a fluorescent yellow pedal board for Julian Cope, a guitar rack for Mike Rutherford and a speaker for Lou Reed – an exact copy of one the sax-playing Cornish built in 1975 for his electric flute. What ever the amplification-related job, the trust invested in the two of them is complete, and rather touching.